Imprint Method: Color Surge, Product Color: Black Modern Plaid, Imprint Method: Color Surge, Product Color: Lime-Royal-White Circle, Imprint Method: Color Surge, Product Color: Royal Distressed Dots, Imprint Method: Color Surge, Product Color: Lime Gingham, Imprint Method: Color Surge, Product Color: Gray Chevron - Perfect promotional giveaway that provides instant shade from the hot sun and protection from the pouring rain. 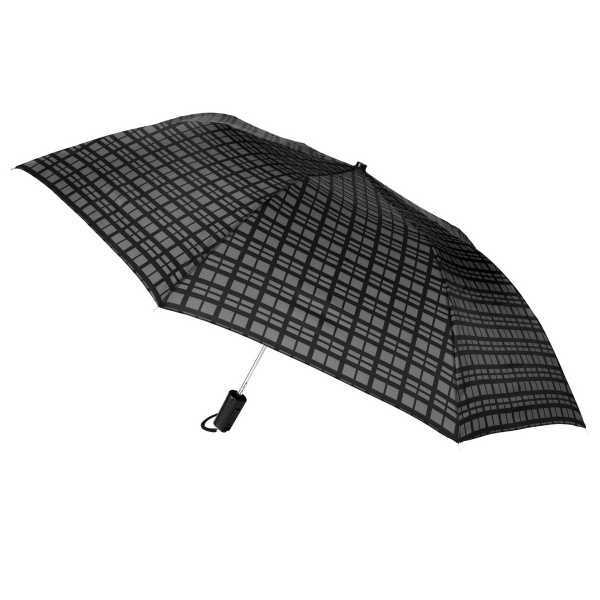 With bubbly polka dots splashed across the top, this promotional product chases away the rainy day blues. Simply add your custom imprinted logo for instant attention every time it opens. Features metal shaft with plastic handle and a 44" arc. Folds to 16". Perfect for business executives and frequent travelers. Price Includes: For new orders. Minimum order 100 pieces.